Online poker tournaments are a dream come true for poker fans. Participating in a live poker event can be exciting but having access to any type of poker tournament from the comfort of home, that’s even more exciting! Online poker tournaments are provided at top poker sites, providing players with access to tournament events with guaranteed prize pools, unique formats, and low buy-ins. Every minute of every day, an online poker tournament is running, so players have limitless possibilities when it comes to online gameplay. At an online poker site, players will find a tournament schedule. Depending on where you visit, the schedule can include multi-table tournaments, sit-n-gos, guaranteed events and more. BetOnline and Sportsbetting.ag are great examples of online poker sites offering tournaments for players in the US, while 888poker and Betway are perfect for international players. Read on to find out more about the best online poker tournaments and sites available in your region below. When it comes to top online poker tournaments for US players, the best poker rooms we can recommend are BetOnline, Bovada and SportsBetting.ag. Each offers a unique array of poker tournaments, making it easy for players to compete against others and hopefully come out the victor! At this online poker room, players will find a quality selection of cash gaming options, tournaments, promotions and more. At BetOnline, players will find a mix of Texas Hold’em and Omaha games in varying formats, from No Limit to Fixed and Pot Limit. For tournament gaming, there are satellites, freerolls, and guaranteed events, plus Winner Take All, Bounty events and more. The site offers a nice welcome bonus of 100% on your first deposit, providing several banking methods for depositing including Bitcoin, Ethereum, Litecoin, Visa, and MasterCard. For payouts, easily use the cryptocurrency options mentioned or other methods like Skrill or Neteller. Every Monday to Friday you’ll have the chance to win $7,5000 in guaranteed prize money by joining this BetOnline poker tournament. The buy-in is just $11. Don’t forget it starts every weeknight at 8:30 pm ET // 5:30 pm PT. For excellent poker tournament gaming with a plethora of options, Bovada is the online poker site to choose. Here, players will have access to a long list of tournament options including Jackpot SNGs, guaranteed high roller events, weekly guarantees and so much more. Bovada offers Texas Hold’em and Omaha, in varying formats, both providing tournament options. The most popular tournament at the site has to be the $100K guaranteed, running every Sunday and offering a massive prize pool for those who manage to outlast the field and earn a payday. For new players, a 100% poker welcome bonus is offered with Bitcoin, Visa, MasterCard, and American Express provided for deposit. Bitcoin can also be used for withdrawal. Every Sunday at 6pm ET, Bovada host a high roller tournament with a prize pool of $100k! The buy-in starts at $162. New Bovada poker players will receive invitations to six exclusive qualifiers for this Sunday Major. A $100,000 Guaranteed tournament is sure to be on most players’ wish list. If your love tournament gaming, you will find a nice selection of options here at SportsBetting.ag. During the weekdays, $7,500 in guaranteed tournaments are up for grabs while the weekend features $130,000 in guaranteed prize money. No matter when you log on, you are sure to find a tournament to participate in. Omaha and Texas Hold’em are the top gaming options provided at SportsBetting, with the most popular tournament being the $50,000 Sunday event. On the last Sunday of the month, this tournament doubles the prize pool, offering $100,000 with a buy-in of $109. New players to the site will have access to a 100% new player bonus with options for deposit including Bitcoin, Ethereum and Litecoin plus Visa and MasterCard. Withdraw any winnings via Bitcoin. 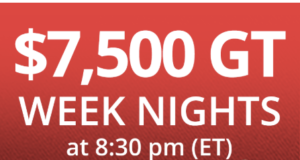 Every weekday night, starting at 8:30 pm the 7.5K GT Winner Series start. Also, 10 lucky players get to win free entry to the $50,000 GT that takes place at Sportbetting.ag on the last Sunday of the month. There are several of these entries, so make sure you have the right one. For our international readers, there are plenty of quality poker sites that offer a broad range of tournament gaming. Serving US players, BetOnline is a nice option for international residents as well. But sites that strictly serve international players are 888poker and Betway Poker. Both sites have a solid reputation as a top poker provider, offering a secure gaming platform, quality banking methods, solid tournament options and cash games. As a trusted name in the online poker world, Betway Poker is a top choice for international players. The site offers easy to use software with fast-fold poker and quality tournament gaming. Games on offer include Texas Hold’em, Omaha, 7-Card Stud, and Razz. Traditional tournament options are on offer here including SNGs and MTTs. With buy-ins ranging from the low to high-end range, players can easily find a tournament to participate in. For new players, the online poker site is offering a 200% welcome offer worth up to £750. New players can give their bankroll a boost by playing for their share of £9000 worth of freerolls and other tournaments. Banking methods provided for deposit and withdrawal include Visa, MasterCard, Neteller, and Skrill, among other options. Sundays don’t have to be boring. You play at Betway Poker can enter to win to $3,000 just by having 100 raked hands in the past 7 days. It’s virtually a free buy-in, and a lot of potential for weekend fun. You’ll have 8-minute blinds and a starting stack of 1000. The action starts every Sunday @ 18:00 GMT / 19:00 CET. Perhaps one of the most respected brands in the industry, 888 is one that is synonymous with online gaming. 888poker is a top option for international players, offering a long list of cash gaming options plus tournament play. As far as gaming types are concerned, the online poker site offers Texas Hold’em, Omaha, Stud, SNAP, and BLAST. The tournament gaming section is quite large, featuring SNGs, MTTs, Heads up, satellites, deep stack, the XL championships and more. There are so many tournament options to choose from here, it is hard to pick a favorite! For new players, there is a free $88 bonus on offer, no deposit needed. To deposit and withdraw funds, easily use Visa/MasterCard, Neteller, and PayPal, among other methods. With a buy-in of $15, The Mega Deep tournament at 888Poker is a great option for savvy players. It has a reasonable buy-in action, large stack, and long blinds. It has become a popular online poker tournament that takes place every week with a $100,000 prize pool. Because there are so many online poker tournaments to choose from, you may have difficulty knowing which option will be best for you. Learning more about the more popular formats will help you to find your own favorite, trying a few variations during gameplay. Cash Game Tournaments: Simply pick your buy-in from the tournament schedule and get started competing for an overall prize pool with payouts based on finishing spot in the event. Bounty Tournaments: This tournament plays like a traditional event but offers an added cash prize to the player as they eliminate their competitors. Satellite Tournaments: This event will be a qualifying tournament for another event. Players will compete in satellites to move on to compete in larger tournaments, including live events. Such tournaments can take place on a daily, weekly or monthly basis. Each of these tournament options is available at our recommended sites. For US players, choose BetOnline, SportsBetting.ag and Bovada Poker. International players should visit Betway Poker and 888poker. To play online poker tournaments, you first need to join an online poker site. Choose from one of our recommended sites and follow the easy steps below. Sign up for a new player account at an online poker room. We suggest choosing BetOnline for US players, or if you need to access and international site, go to 888poker. Download the online poker software and log-in. If you need further clarification on each site, make sure to visit our US Poker Sites and Online Poker Reviews. Most of the Poker Site pages will have specific download instructions. Once logged in, look for the Cashier to make a deposit. Review our Deposits page to make sure you have all the information when making a decision about what is the best option for you. Choose your deposit method and add funds to your account. Most online poker rooms will let you choose from a list of options ranging from money transfers, credit card deposits, or using cryptocurrencies like Bitcoin. Look for the Tournament tab within the poker lobby. You will then need to choose the kind of tournament in which you would like to play and what is the best option according to your bankroll. Select your tournament based on format, buy-in and prize pool, among other features and start playing. Choose a Familiar Format: Choose a game or tournament type you have played before when competing for real money. When you want to try something new, opt for a freeroll or low buy-in satellite to get a feel for the tournament type. Work Your Way Up: tournaments with satellite entries or step qualifiers are a great way to work your way up to higher buy-in events. You start out with a lower buy-in and then win your way to the larger events. This way you spend less money and hopefully earn a payday. Have Fun: it’s also important to remember to have fun. With tournaments, there are so many options to choose from. Find formats that work for you that you enjoy.